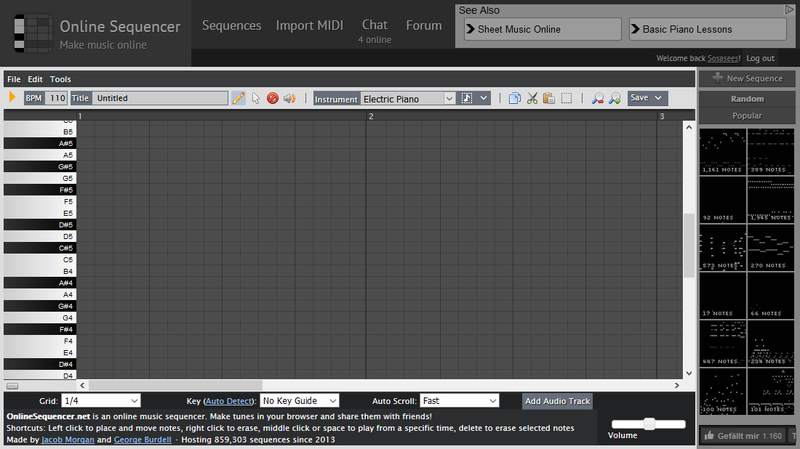 These are the Basics of making Music with OnlineSequencer. 1. What Parts of the User Interface are not needed to make Music? Part of the URL with the Song ID (e.g. The first Thing you need to know is, how to Place Notes. It should be selected by Default, if you open OnlineSequencer. If you made a Mistake, you can Switch to the Erase Tool , or just right-Click the Notes you want to Erase. Remember: OnlineSequencer does NOT Auto-Save your Songs. But if you are not logged in as a Member, you cannot delete your Song anymore, and it's Uploaded forever on OnlineSequencer. But if you do log in as a Member, all Songs you Upload are listed in your Profile, and you can Delete them, if you really want (But that cannot be Undone once it's done). But if you Save one your Songs again as a logged-In Member, it will be overwritten. I'll explain later how to save an Edit of one of your existing Songs as a new Song. You have read the most Important Information. Below is more Important Information. It's not as important as everything above, but it's still important. Come back when you're ready. so I can't tell you, what ,,Save a Copy'' is, because I don't already know. ,,Save local file'' saves your Song not as a Song, but as Song Data in Form of a simple TXT-File. This TXT-File can later be dragged and dropped into OnlineSequencer's Music Editing Tool, in order to Load it. This way, you can save your Songs on your Hard Drive without making them public. And ,,Export MIDI'' of course, exports your Song as a MIDI File that can be played and/or edited with Software, that Supports MIDI Files. With the Select Tool, you can Select Parts of your Song by clicking and dragging in order to create a Box. When you get the Mouse Button up, Parts of your Song are selected. If you want to Select more than you already Selected, Hold Shift while Selecting. You can Copy Selected Parts of your Song by using the Copy Tool or pressing Ctrl and C, and paste them by using the paste Tool or pressing Ctrl and V. You can also paste Parts from one Sequence to another. 9. Play your Song from a specific Point. but also if you want to Save an Edit of one of your existing Sequences as a new Sequence. but if you are logged in as a Member, your Songs will be overwritten, if you edit them and then save them again. This often comes in Handy, but sometimes you want to save an Edit of one of your Songs as a new Song. 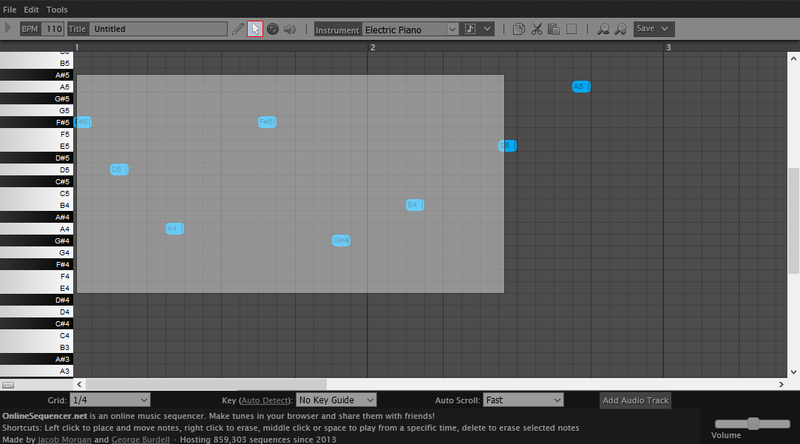 and then paste it in a new OnlineSequencer Tab using Ctrl and V (not the paste Tool). If you save the Pasted Song, it'll be saved as a new one. Just make sure you're saving the pasted Copy, not accidentally the Original. Eventually, you'll need more Instruments than just the Electric Piano. From there, you can select every available Instrument OnlineSequencer has. If you place Notes, thye'll come with the selected Instrument. If you've selected Notes and then select a Instrument, the Instruments of the selected Notes will be changed to your selected Instrument. Now you've read through everything important. I'm pretty sure you'll find out the more advanced stuff yourself. I hope they are useful, too. This is actually relatively professional and very informational, I vote for this to be the new tutorial.